At Mathnasium, we know how vital learning maths is in primary school - it forms the foundation for all your child‘s future maths studies. To make it understandable, we take an orderly, logical approach to teaching it to your child. This foundation we give them is essential for the more advanced concepts which they will encounter in secondary school. Primary school students work one to one with our instructors in a unique combination of mental, verbal, visual, tactile and written exercises. Beyond teaching students all-important maths concepts and skills, our special programme helps them build number sense by showing them just how numbers work. As it progresses, students get more and more comfortable with numbers. We call this numerical fluency—the ability for primary school children to effortlessly recall addition and subtraction facts—a valuable asset when they face upcoming challenges in maths. Each child is evaluated with a written and verbal assessment unique to Mathnasium. Based on the assessment results, we create a custom programme designed to help close educational gaps they may have and make it easier for them to jump ahead when they’re ready for advanced maths challenges. Additionally, we help children understand their school homework as part of each session, as well as help them prepare for school tests, standardised tests, and various school entrance exams. By giving your child a firm foundation—and confidence—in maths, Mathnasium can keep them from falling behind in the future and help them avoid the problems and upsets that falling behind can bring. 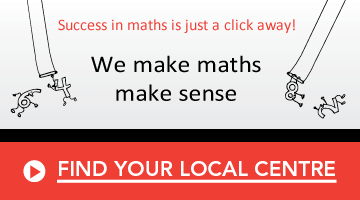 Primary school students who love maths and are good at it come to Mathnasium to experience areas of maths typically not covered at school. The strong introduction they get helps them build the foundation for continued maths success in secondary school, sixth-form, and beyond.